In my Embroidery group, the Crazy Embroidery Ladies, we get a little kit of things to use up when we’re on summer leave. This summer we got a kit to make a ATC Embroidery. 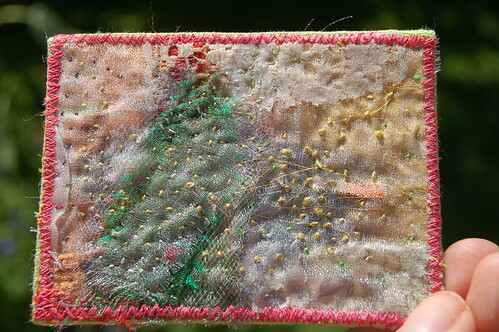 I had enough of green fabric to make a second one, taking the beloved “mixed media” approach this time. I love the layers and the texture of this second one made from a mix of bits and pieces from my stash. Angelina, sheers, lace, silk and little stitches of embroidery. Making these ATC pieces takes time, even if they are small. I will not offer them up for trading because I want to keep them as samples of my work. As little pieces of memory. Summer time feelings and texture trials. My creative mom has already made several and started her own collection in a business card binder. She is much more productive when it comes to embroidery than I could ever be. I’m always distracted by paining, writing, blogging and other projects big and small. Mom made me a special ATC for a trade I suggested we do. She finished hers before I even thought about starting mine, so I need to keep working on one for her. It will reside in her new ATC collection as love token from me. My own ATC collection is huge as I used to trade collaged ATC’s a few years back through flickr, one for one in pretty envelopes. These two are my first adventure into embroidered ATC’s though. It was fun. I will make more ones. This entry was posted in Crafts, Fabric Art and tagged ATC, embroidered atc, embroidery, first try. Bookmark the permalink. These are charming and I loved your tree from last year, it was spectacular. The green linen sets off your pink stitching! You do the coolest stuff here! They are both gorgeous! Hi Hanna! I turn to your blog again and again for inspiration. Your ATCs are no exception – so inspirational! Here’s a question, though: When you assembled all of the layers in the 2nd card, how did you get them to “stick”? Are the tiny embroidery stitches actually holding the piece flat and together, or is there something like net that I’m just not seeing? Thank you again for everything you’ve posted! Thanks for commenting! Robin, I used pins to temporary put the bits in place and then my stitching is what holds it all together. The Angelina fiber is also a bit sticky when you iron on it, so maybe that helped but I don’t think you need it. Just cut little bits and pieces of pretty fabrics and pin it all together with quilting needles and start sewing! 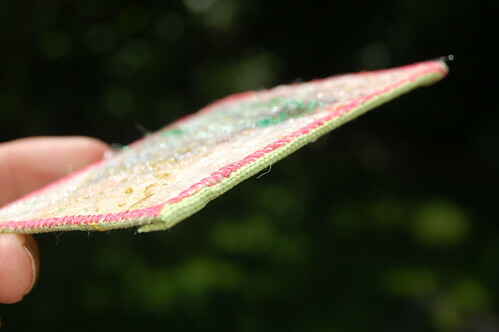 Then I glued the fabric to a atc-sized cardstock! Ta-da! what a fabulous version for atcs! yes, i think i would keep them as well. Anyway, as usual it was an inspiring visit here. Thanks! Wow, these are great work. I’ve never seen embroidery like this – 2nd and 3rd photo. They are amazingly beautiful. Evelyn, thanks, I haven’t seen anything like these either, I just made them up when looking through my materials here at home. I love your embroidered ATC. I have only made a few ATC’s but I really like your thought about them being practice for larger pieces. 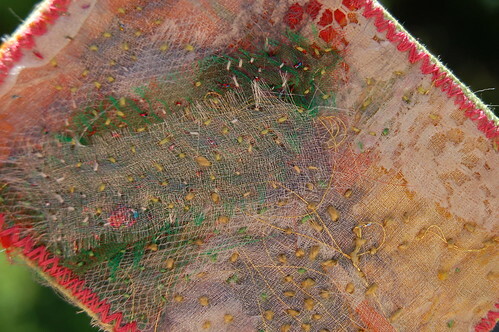 Embroidery for me comes so easily, but mixed media, well, that is another story. I just dont think in layers, I guess! Don’t you love little things you can work on wherever you are? I am working on little things right now, and I cart my bag of goodies around with me everywhere. It is not only good to keep my mind off the time it takes to get anywhere, but it also keeps me inspired for the big things I can’t do unless I’m in my studio! Lovely post as always. I read your site avidly from England and you’re a great inspiration. 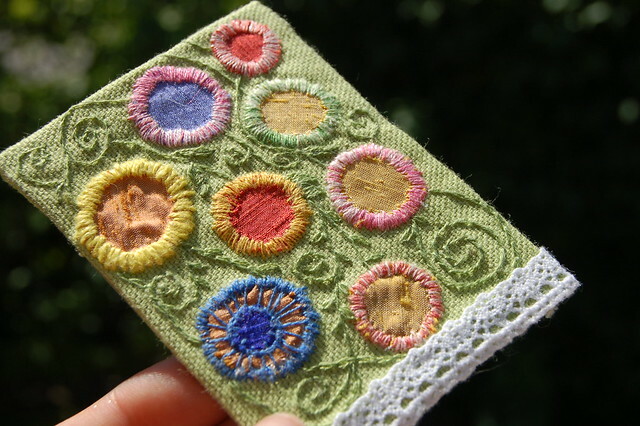 Sewn ATCs are beautiful – keep up the great work with your site! Oh my, I love those embroideries. The style is lovely. Inspired? Yes, ma’am! I showed my mom, and I think she’s going to get one too! Thanks for sharing! 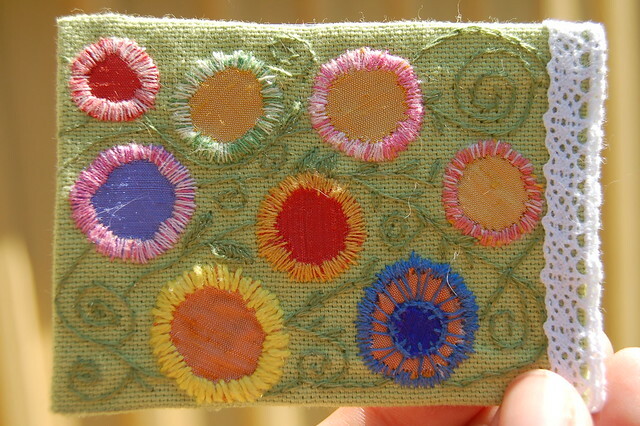 Your embroidery ATC’s are just lovely and I can understand you keeping them! I wouldn’t be able to give them away if i had made them! My goodness, Hanna – these are exquisite! You have such a talent for stitchery – not only the technique, but an amazing modern design eye. Thank you for sharing these! You have such a good talent , But I see the dates are from 2010 and now its 2015 please make more post for this craft, I love your work.